Helm of Tohan is an official plugin that includes a new quest to find the titular, legendary artifact. The quest can be started by asking for rumors around Dagon Fel, who will direct you to the Daedric ruin of Onnissiralis. Outside the ruin are two warring brothers, one of whom will accompany you as you enter the ruins to find the artifact. It is not an Artifact in the usual sense in TES games, as it does not come pre-enchanted. Helm of Tohan: Help two brothers avenge their father's death. Notes: This helm is usable by beast races, like all Adamantium Helms. The Helm of Tohan also has triple the enchantment value of the standard Adamantium Helm added by the Tribunal expansion, though its stats are otherwise the same. 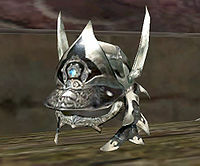 It is the most enchantable helm in the game, including all official expansions and plugins – double the enchantability of even the Daedric ones, and half-again as enchantable as the Telvanni Cephalopod Helm, the most enchantable in the vanilla game. If you are not running Tribunal but are running the Adamantium Armor plugin, then Helm of Tohan is the only way to get any Adamantium Helm. This page was last modified on 19 October 2018, at 21:15.